The Saskatchewan Roughriders have signed kick returner Kendial Lawrence, defensive back Ed Gainey, and acquired offensive lineman Bruce Campbell from the Toronto Argonauts. The Riders announced all the moves Wednesday. The team has also reportedly signed former Edmonton Eskimos linebacker/defensive linebacker Otha Foster, according to Murray McCormick of the Regina Leader-Post. Lawrence spent the past two seasons with the Eskimos after starting his career with the Hamilton Tiger-Cats. Lawrence has 59 kickoff returns for 1,359 yards and two touchdowns, and 142 punt returns for 1,410 yards and one touchdown. He has spent time at both receiver and running back. Campbell started all 15 regular season games played and the East Semi-Final for the Argonauts last year after signing with the team in March, 2015. The Roughriders also signed free-agent defensive back Ed Gainey and made the Shamawd Chambers signing official. The five-foot-11, 195-pound Gainey spent the last two seasons with the Hamilton Tiger-Cats after beginning his CFL career in Montreal. Gainey, 25, has played in 43 career games, having registered 69 tackles, 25 special-teams tackles, two interceptions and three fumble returns, including one that was returned for a touchdown. The Roughriders also announced the signing of Canadian receiver Shamawd Chambers. The six-foot-three, 219-pound native of Markham, Ont., spent the last four seasons with the Edmonton Eskimos and was named the top Canadian in the club's Grey Cup win last November against Ottawa. Chambers has played in 50 career regular-season games, having recorded 112 receptions for 1,234 yards and seven TDs. 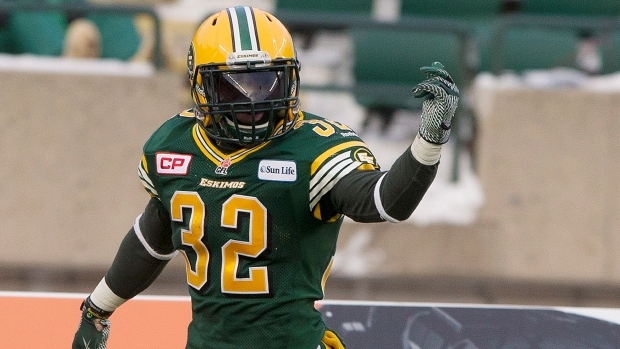 Another former Eskimo, running back/receiver Kendial Lawrence, followed suit and signed with the Riders as a free agent. The five-foot-nine, 195-pound Lawrence spent the last two seasons in Edmonton after beginning his CFL career in Hamilton.